More than 150 people came to find out more about a popular dog-walking and cycling path which is under threat. On Saturday, Friends of Centurion Way hosted a public exhibition to raise awareness for the future Centurion Way, now uncertain as part of the Whitehouse Farm 1,600-home development to the west of Chichester. More than 150 people came along to Chichester Scout Hut in nearby Sherborne Road, to find out more about the draft plans for the rerouting of southern part of Centurion Way, as well as to show their support for preserving it. Many were eager to share their thoughts about why they love the path so much, and the group collected more than 100 signatures on a card to go to the Department for Transport stating their support for the path. One resident said: “Centurion Way is a quiet, safe access from one part of Chichester to another. Attendees included regular users of the path, local residents, city and district councillors and the Mayor of Chichester Peter Evans. Many stated their concern about the impact that the rerouting would have on Centurion Way and their safe, traffic-free route into the city, often travelling to work or to the shops. This included those who are visually impaired or disabled. Not only is it a smooth, step-free and curbless route in and out of the city, but they also explained that the familiarity of the path, the wildlife, the trees, scents and sounds enabled them to know exactly where they were, just through the song of a particular bird or the scent of a flower. One attendee said: “People that can’t walk so well, people with mobility scooters, it will take them much longer to get to the shops and it will take away the easy access. The Friends presented a dossier, put together in collaboration with local experts on various aspects of Centurion Way, sharing core messages about why the path should be preserved. One stand included information about the history and legal status of the path, and its heritage as an old railway line, with input from former CEO of Sustrans John Grimshaw, who negotiated and built the path back in the 1990s. There was also a stand presenting different species of plants, birds and animals that live on the path, and why it is such an important habitat for many different species of wildlife, flora and fauna, some of which are endangered. Should the path not be preserved, it would mean the loss of a key wildlife corridor. One attendee, from the Chichester Natural History Society, said that they had conducted various studies on the area, and had ‘recorded quite a few sightings of endangered flowers and species’. 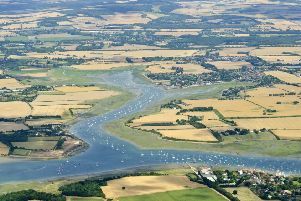 A member of Friends of Centurion Way group said: “Any wildlife needs a corridor to move from place to place, and if we disrupt it at the southern end, it will be very bad for any wildlife at all, as we will lose the link between Chichester Harbour Area of Outstanding Natural Beauty and The South Downs National Park. Legal disagreements over land between several parties has seen phase one of Whitehouse Farm stall, with full planning permission, due to be signed off last year, still not agreed.